Foreign Minister Wang Yi invoked one of Chairman Mao Zedong’s most famous sayings when he warned Trump not to “damage China’s core national interest.” “Don’t lift a boulder and let it fall on your own feet,” Wang said while on a visit to Europe. The Global Times, which reflects hawkish views within the leadership, hinted that Beijing is ready to use military means to retaliate. “Especially in the Taiwan Strait, China is now confident enough to arm-wrestle with the U.S.,” said the party mouthpiece. 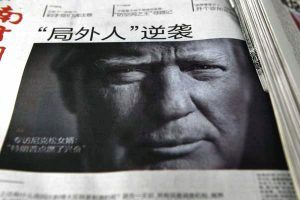 More significantly, both Chinese, Hong Kong and the U.S. media have reported that the Chinese Commerce Ministry and Foreign Ministry have drawn up a list of American companies that could lose substantial business if Trump refuses to return to the One China Policy. These companies include Boeing, Caterpillar, Walmart as well as automobile and IT companies which have benefited from the China market in the past decade or so. Beijing has also hinted it will work with its allies – including North Korea and Iran – to undermine American interests worldwide. At the same time, lobbyists and public relations firms in the U.S. which are employed by Beijing have been calling on influential members of Congress as well as think tanks to stop Trump from departing from the One China policy, which is a consensus among both Republican Party and Democratic Party leaders since the 1970s. The Xi Jinping leadership as well as the CCP Central Leading Group on Foreign Policy – China’s highest-level diplomatic decision-making organ – are most worried about the following: . . .